“Eagle Feather” Coil Bracelet. $325. The eagle feather carries our prayers to spirit; as a gift, it is an honor conferred, a sign of respect for the person who has earned it. Wings calls its power into the spiraling hoop of this coil bracelet, one strung with gifts of the earth in the mottled earthy tones of Eagle’s own robes. At either end are the feather’s downy fringe, made of Hawai’ian puka shell in hue a shade off snow-white. Just above, the raptor’s characteristic mottling begins, expressed in the form of a length of doughnut-shaped rondels of variegated fossilized dinosaur bone. 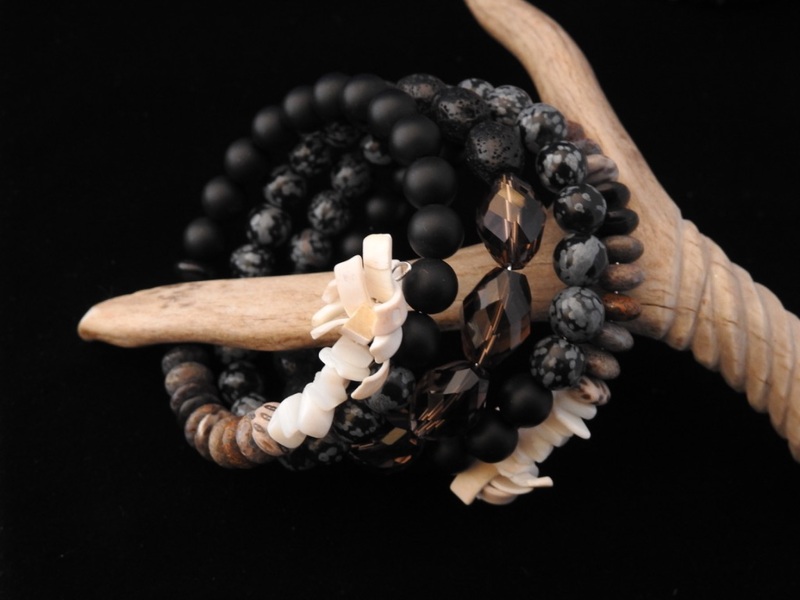 The bone flows into shades of black with round matte onyx, thence to more round beads of mottled black and white snowflake obsidian, fire and ice that flows into lengths of ovaled barrel beads of basaltic lava rock. At the center rest seven large faceted diamond-shaped barrel beads in smoky quartz, the color of a young eagle’s feathers and the shape of the Eye of Spirit itself. Note: Puka shell fringe beads are fragile; best worn for special occasions, not everyday wear. First in The Respect Collection of The Seventh Fire Series. Designed jointly by Wings and Aji. Posted on Friday, October 26th, 2018 at 3:11 pm. Filed under: The Coiled Power Collections, The Respect Collection, The Seventh Fire Series	RSS 2.0 feed.